The English government have sent over a man to be known as a ‘British Resident’, James Busby. He has been sent to New Zealand as a response from the letter sent the by the native people. 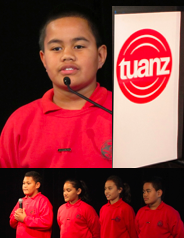 Maori people needed help because they felt they were being treated fairly by the English settlers. It is said that when James arrived in New Zealand, the Maori people had no respect for him because his lack of firearms. They named him ‘man of war without guns’. James Busby forged a declaration of Independence. It was for the people of New Zealand to become an independent country. Rumors have spread, saying that a Frenchman by the name of Charles de Thierry has said that he would invade New Zealand with a French army with hundreds of men. James Busby took this as a serious situation and travelled around the top half of New Zealand requesting Maori chiefs to sign the Declaration. The French government have informed us that the French have never actually wanted to claim New Zealand. Therefore Charles de Thierry, who was thought to have an army was a false statement. New Zealand was now safe from French colonies and other threatening countries. From this we will hope to see New Zealand finally become one as a nation. This traditional ritual doesn't feel right anymore, killing off an innocent elderly won’t help anything. I mean, I know that as we were children our fathers and mothers would tell us to always stay to tradition. But I say nay, the crops haven’t grown, water produce is low, our resources are beginning to become scarce. A ritual that does not help with our needs, is not needed? Lindsay's old man was chosen, killed by the very citizens which once called him a friend. Do we as a village have no heart? The ability to turn on an elderly which once took care of you. It astounds me. People I say lets stand together as one village and wipe this ritual from our memories so that one day we may be able to see our grandchildren. This is my speech to you folks in hope that you have the same passion as I do. So who will stand with me? Who will fight for our future and our childrens and their childrens future? If you’re with me say ay!... Right then a bright future is ahead of us. 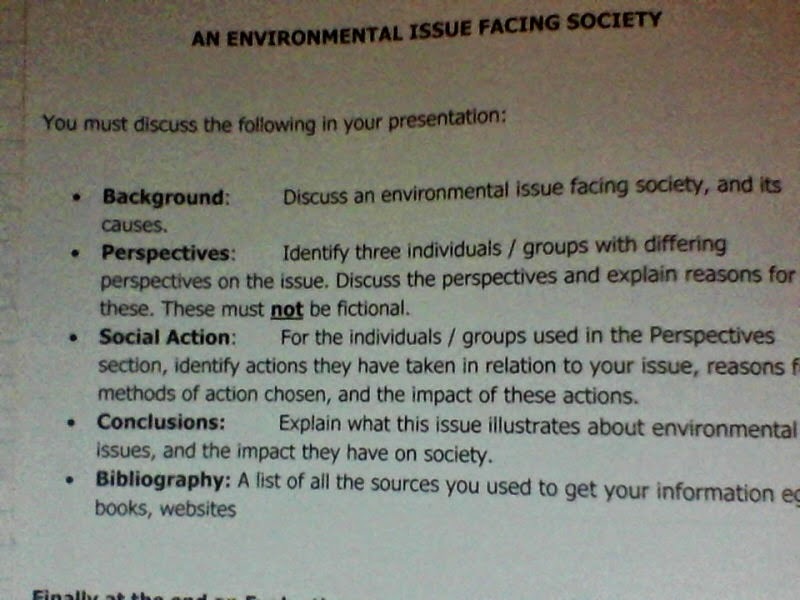 In my Humanities class, we were all given an assignment to discuss and share "An environmental Issue Facing Society". Here is my presentation and the marking schedule. There are many ways to produce electricity using non-renewable sources. Some of these ways include: Coal, Oil and Natural gases. Non-renewable means once a source is used it can not be returned to its original form. I think the best way for New Zealand to produce electricity is by using Natural gases. This is because it can be used for cooking, heating and fuel. Natural gases also do not release dangerous gases or have any harmful effects to the environment. I also believe Natural gases are the best way for our country because it is easy accessible and affordable for people to use. Coal is an energy source when combined with heat, is used to create electricity. It can be also as a fuel for heat. Coal, when heated releases smoke which affects the environment and contributes to global warming. Coal is used almost all around the world in factories creating electricity. Most countries do not consider this fact. Coal is found in various places in the world and can be considered as a common resource. Coal is created from animals bones, rotting trees all under the earth which has been compressed and heated over thousands of years. Because of this coal is not a source that can be maintained and humans can not continue to abuse coal. Oil is an energy source used all around the world to create electricity and many other purposes. Oil leak out in the ocean is around the earth and is pollutes marine life. There are lots of countries which mine oil too. Oil is one of the most important resources. Most of peoples daily needs depend on oil. Oil is created by compressed waste over thousands of years and this is why humans cannot create this type of fuel. As time passes oil will become scarce and its prices will continue to rise. People will have to find an efficient way to replace oil. Natural gases is a source found in the earth that can be used for heating, cooking and can also be used for electricity. Natural gases do not release dangerous gases into the atmosphere like coal does. Natural gases like all the other sources has been compressed over thousands of years. But Natural gases is not easy to find. People are using it at a fast rate and the original source can be renewed at an efficient pace. Natural gas is good for controlled fires, cooking and heating. Lots of people use a gas heater rather than an old fire place. People also use gas ovens. In conclusion all these non-renewable ways are not sufficient. But I think the best non-renewable source is Natural Gases because it is partially clean for the environment and is easy to control. In the novella "The Birds" by Daphne Du Maurier, the author explores the subject of hubris. The greediness of mankind, thinking that we're superior and that nothing can harm us. She suggests that human beings suffer from hubris, which makes them unprepared for possible threats from the world. In the exposition, Du Maurier shows how Nat, the protagonist, is clam and confident and not concerned about the strange behaviour by the birds. In the inciting incident, Du Maurier shows how Nat is unprepared for an attach by the birds, and becomes panicked. Because Nat, the protagonist, is arrogant and tries to use different excusees like " a message comes to the birds in autumn", like a warning. This shows he is pretentious. The protagonist (Nat) becomes frightened and afraid as soon as the birds begin attacking him and his family. After the endless attacks by the birds he begins to feel a little impressed by the birds and there sense of organisation. Nat the protagonist becomes afraid and organised this is shown when " The blanket became a weapon of defence" this shows that Nat was not ready for the possibilities that he was unprepared. 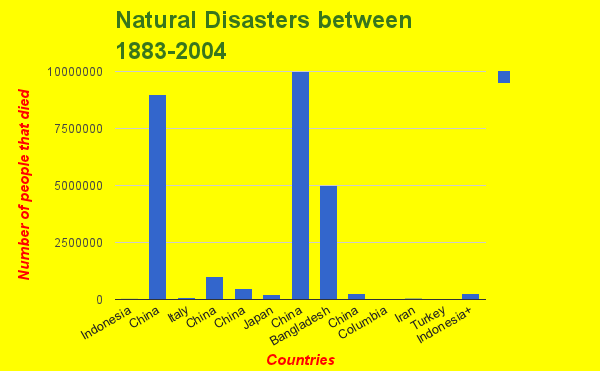 For Humanities at St Peters College we have been learning about Natural Disasters. Here is a graph to show my findings and learning. A new year, starting a new school it does feel weird. St.Peters college an all boys school, private, right next to Auckland Boys and Catholic. That’s my new school, that I would be attending from now onwards. It sent a shiver up my spine even thinking about a new school. 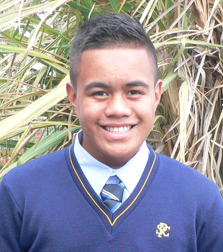 Orientation day, the day where I got to meet some of the other year 9’s that were starting at St.Peters college this year too. “Good Morning Boys!” exclaimed Mr Neville. Mr Neville is our Dean (which means he’s in charge of all the students in year 9 level) “Good morning sir!” We answered. He told us all about the college and its principles to follow by. We followed him around the school and saw most of the classes which we were going to be in. 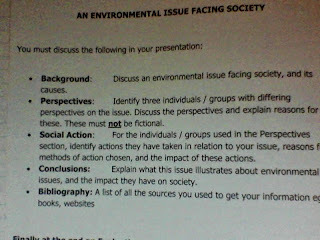 It was a junkload to take in, I was still trying to figure out which classes I would be in? My favourite subjects include, Maths, French, P.E, Art, Humanities (History and Geography). Some of the other subjects I find a little more challenging like English and Science. This year has taught me to become more independent and organised for example catching the bus to school, learning to move class by class and getting my stuff ready for the next day. This year one of my goals is to do well in school academically and also in sports. I hope that this year will be a good year.